Restore hair luster and shine with these natural hair care products that deliver moisture where hair needs it most. Get the maximum benefits of Argan oil with Shiny Leaf Argan oil Shampoo and Conditioner Set. This set of products keeps hair manageable and frizz-free! Dry and damaged hair happens when hair products are too harsh on scalp. Shiny Leaf Argan Oil Shampoo cleanses hair gently while providing nourishment that improves hair health. 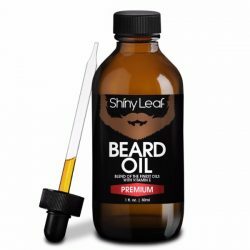 It contains Argan oil, which is a potent antioxidant that protects hair from damage. The Argan oil in the shampoo delivers moisture to make hair soft and smooth after wash. 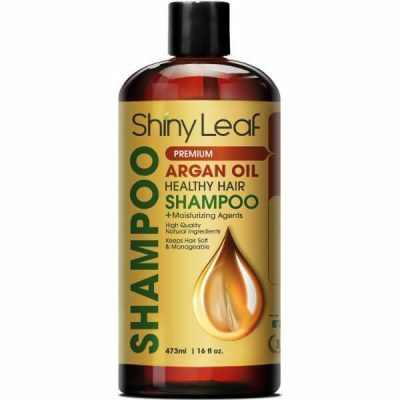 Shiny Leaf Healthy Hair Argan Oil Shampoo leaves hair manageable and easy to style. Using the conditioner together with the shampoo keeps hair shiny and lustrous. The conditioner contains keratin amino acids and coconut oil, which help lock in the moisture on hair. It keeps hair frizz-free by conditioning hair for long-lasting moisture. Condition hair for long-lasting moisture with Shiny Leaf Moisturizing Argan Oil Conditioner. It is rich in essential fatty acids that seal in the cuticles of hair strands to prevent frizzy hair. The keratin amino acids strengthen hair to make it more resilient against damage. It gives hair a shiny and lustrous appearance as well. This power duo improves hair texture and shine while promoting healthy hair growth. They provide vitamin E that replenishes moisture to hair. The shampoo and conditioner work for all hair types especially color and chemical treated hair. These products are made from high-quality ingredients that hydrate and nourish hair. 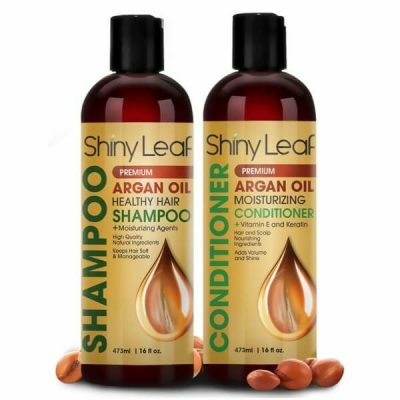 Shiny Leaf Argan Oil Shampoo and Conditioner Set makes hair easy to manage and style. It protects hair from damage caused by styling tools. These products make hair smell fresh and clean all day. Experience the power of Argan oil to make hair healthy and strong! 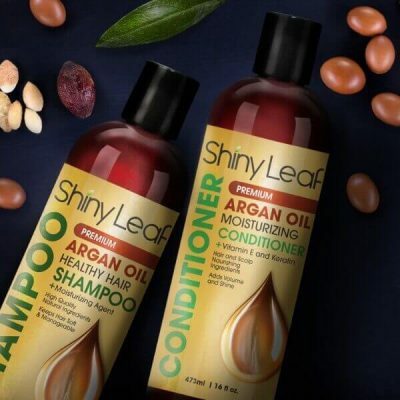 Shiny Leaf Argan oil shampoo and conditioner come with a refreshing scent. Gentle to colored and chemical-treated hair. 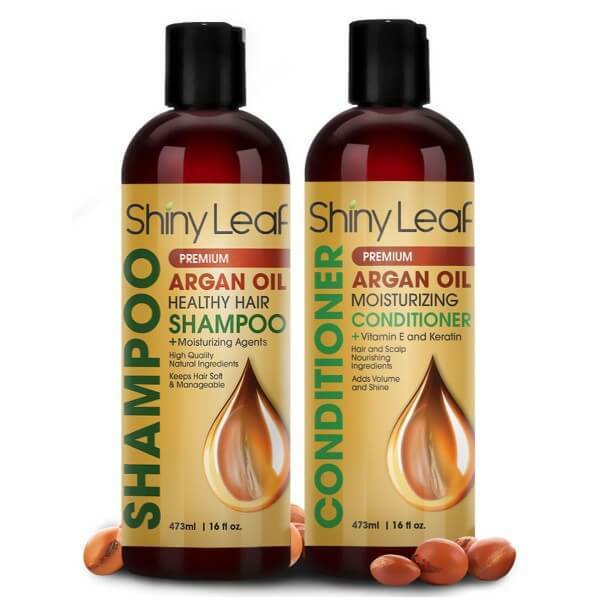 Shiny Leaf Argan oil shampoo and conditioner contains high-quality nourishing ingredients. Reduces risks of hair fall. Shiny Leaf Argan Oil shampoo and conditioner nourishes all hair types. Gets rid of impurities while preventing hair dryness. Improves hair health and resilience to prevent damage. Restores hair shine and strength. For external use only. Avoid direct contact with eyes. Rinse immediately with water once contact occurs. Use the products daily to get noticeable results in a few weeks. Wet hair and scalp. Use enough shampoo to cover hair from scalp to tips. Massage and leave on for 2-3 minutes. Rinse hair with warm water. Wring out excess water from hair. Use enough conditioner to cover hair from scalp to tips. Massage gently and leave on for 2-3 minutes. Rinse with warm water. Make sure not to leave any soapy residue.